Hey well, Iv moved on from these sizes, and spirals take up a lot of room so I thought I would list them here and see if anyone wanted them? I'm not sure what resale values are but for the glass ones i figured maybe $5? 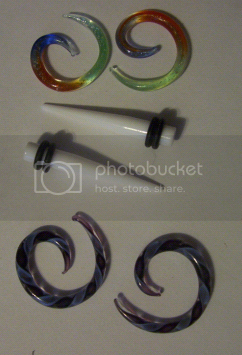 The spirals are both glass, and size 8, the tapers are acrylic size 4, Iv never used them because I don't like spikes, they came with a pair of plugs that I wanted. 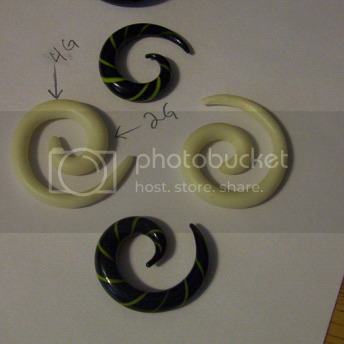 In this picture I'm only selling the whitish spirals, the black ones are there for comparison. Id also warn you that I made these out of Fimo so I wouldn't use them unless your ears are healed. They glow in the dark and I really liked them for a while, they are not PERFECT but the size difference is very slight. I only marked the 2G area because its the biggest part, but honestly I think they would look a bit odd pulled up that far, so 4G is what I'm listing these as. If anyone wanted the whole lot, id let them all go for $15 and that's shipping included.